The entire Fifth Circuit Court of Appeals has agreed to decide whether Texas burglary of a habitation under Texas Penal Code 30.02(a)(1) is equivalent to "generic burglary" under the Armed Career Criminal Act (ACCA). See, United States v. Herrold, No. 14-11317 (5th Cir. 2017). The court's decision to rehear Herrold comes on the heels of the Sixth Circuit's en banc decision in United States v. Stitt, No. 14-6158 which held that a conviction under Tennessee's aggravated burglary statute is not a crime of violence. The ACCA requires enhanced penalties for individuals with three prior qualifying convictions. 18 U.S.C. 924(e). One way for a prior conviction to qualify is if it is an "enumerated offense." 18 U.S.C. 924(e)(2)(B)(ii). Burglary is such an offense. But long ago the Supreme Court in Taylor v. United States held that "burglary" under the ACCA means “an unlawful or unprivileged entry into, or remaining in, a building or other structure, with intent to commit a crime." This is known in the law as "generic burglary." States often define the crime of burglary differently. In Tennessee, for instance, "aggravated burglary" under Stitt is not "generic burglary" because it covers the breaking and entering of "'mobile homes, trailers, and tents' as well as any 'self-propelled vehicle.'" The Texas burglary statute is similarly overbroad. Texas burglary defines "habitation" as including vehicles “adapted for the overnight accommodation of persons.” Texas Penal Code 30.01(1). But the Supreme Court has never considered the breaking and entering of vehicles, even if adapted for habitation, as the same as "generic burglary." The en banc Fifth Circuit will now decide this question. In addition, the Fifth Circuit has been asked in Herrold to overrule its prior decision in United States v. Uribe on the basis that Uribe failed to properly apply the Supreme Court's decision in Mathis v. United States. Herrold argued in his en banc petition that Uribe improperly treats Texas burglary convictions under TexasPenal Code 30.02(a)(1) as a divisible offense. A favorable decision for the defendant in Herrold could impact long ACCA sentences. A positive decision in Herrold may also affect individuals who received a career offender enhancement based on a Texas burglary prior. 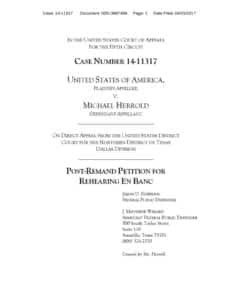 The en banc petition in Herrold can be accessed here: Herrold en banc petition. The Government's response to the petition is here: USA response to Herrold en banc petition. When is it expected that a decision will be made on this? Do you know? Not set time frame. But when the decision is announced I will report on it.